1. Place the sliced jalapeno and vinegar in a bowl with the sugar and a pinch of salt; mix and set aside. Preheat the oven to 220°C, gas mark 7. Toss the broccoli with the oil, season and spread out on a large baking tray. Place on the top shelf of the oven, and put the chorizo on a tray on a lower shelf. Roast for 15 minutes, turning each tray around halfway. Take out of the oven, slice the chorizo and set aside. 2. Meanwhile, mix the yogurt, Tabasco sauce and finely chopped coriander in a bowl. Pour the jalapeno pickling liquid into the yogurt (reserving the jalapeno slices), then mix and season. 3. 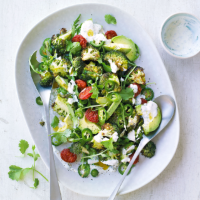 Pile the rocket onto four plates with the avocado, broccoli and chorizo. Drizzle over the dressing, then scatter with the jalapeno slices and roughly chopped coriander leaves. Drizzle with extra olive oil, if liked.